Ajamber Soy of Punnibudi village in Jharkhand had been rearing tasar since 1998, using traditional practices learnt from his father. Like many others around him, Ajamber too looked at the traditional trade of tasar rearing as a loss-making venture, signified by low and unsure returns for the families who practiced it. In spite of his deep interest in trying to better the situation he was not sure how to go ahead. 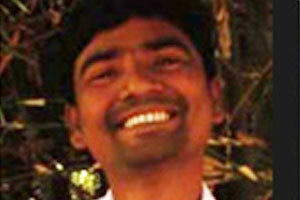 His opportunity came when PRADAN started working in his village. PRADAN highlighted the practices and areas in tasar cultivation that needed improvement in the light of technological advancement, and suggested new methods of silkworm rearing and silkworm seed production. This convinced Ajamber When PRADAN called for volunteers for training in 2004, Ajamber readily agreed and visited Godda to gain exposure to new methods of tasar rearing being promoted by PRADAN. He quickly picked up the modern and improved techniques of tasar sericulture from PRADAN. Back home Ajamber talked to fellow tasar rearers in his village and the neighbouring ones into forming a tasar Vikas Samiti to promote modern tasar rearing. Members of his Azad Jharkhand Samiti took their first crop in July 2004 using Disease Free Layings (DFL – infection free tasar eggs) sourced from Godda. The crop did not do as well as Ajamber had expected due to bad weather. Ajamber then persuaded his Samiti that they should set up a grainage and produce DFLs locally. The Samiti members pitched in to build a grainage and chose Ajamber to run it. PRADAN trained him to use the microscope to examine moths for diseases and in other routines of running a modern grainage. In 2005, the first year of setting up a grainage locally, Ajamber and two other Samiti members reared 600 DFLs to produce seed cocoons. Besides looking after his own crop Ajamber would help fellow Samiti members in rearing. That season he produced 3850 DFLs. His business grew steadily. In 2007 Ajamber supplied 14,000 DFLs from his grainage for the commercial crop locally and sold 8,850 DFLs to outsiders. This fetched him Rs 107,500 net of costs in just one month. His rearers were not far behind. They produced about 5 lakh cocoons, earning Rs 764,000. Out of the income, 15 rearers bought pump sets and two others bought power tillers. With their persistence and perseverance, Ajamber and his Samiti members have set new bench marks in tasar rearing and opened the way for a secure livelihood. Ajamber is now working to build a grainage of his own to meet the requirement of DFLs in nearby areas of Kuchai and Arwan. An entrepreneur by nature, Ajamber made the best use of the opportunities that came his way. He received assistance for procurement of required rearing and grainage equipments from PRADAN. He also mobilised loans from financial institutions for his venture. Buoyed by the support which he received, Ajamber scaled up his level of production over the years. Today he has an annual turnover of over Rs. one Lakh from his grainage, Ajamber, today, has employed eight people in his grainage, and provides them a decent living. He also provides training in silkworm rearing to the youth of his village so that they take up a remunerative livelihood in the village itself and lead a life of dignity. His success has not only created a positive impact on his life, but also on others’ lives resulting in the overall economic progress and welfare of his village. He now plans to set up a plant with turnkey facilities, right from rearing of silkworms to manufacturing silk. In the year 2008 Ajamber was declared the National Winner in the Citigroup Micro Entrepreneur Awards Programme.